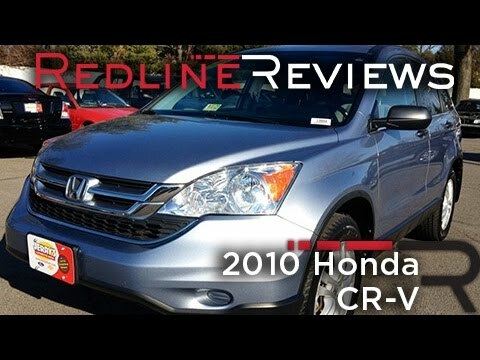 Few vehicles do as many things as well as the 2010 Honda CR-V. As practical as a backpack, this benchmark crossover is an easy, stylish one-size-fits-most car choice. Ac can pull on performance. What I have had trouble with in my vehicle is the battery. I also have a car starter and for some reason there's been some interference with the starter and the battery. It kills the battery and I have had to have my battery replaced 3x now. Something to watch out for. The other thing that I find problematic is because it is a 4-cylinder, when the ac is also on and I am driving on the highway or up hills, it is pushed more and it can lag a bit because it is being pushed. I wish the engine could handle the pull when the ac is also running. These are really the only 2 issues that I have experienced. The Honda is very reliable otherwise and I would recommend. Sporty crossover perfect for everything. I purchased my CR-V used in 2015. I live in a big city and regularly travel to the country. It performs extremely well in both the city and on the highway. I also frequently drive on dirt roads. It is large enough to carry everything I need to pack but also small enough to navigate the city easily. It is very low maintenance, I only need to take it in for regular maintenance like rotations and oil changes. It can be somewhat loud on the highway, but it does not bother me. I have been rear ended once and there was no damage done to the car. It feels extremely safe and reliable. I have had no problems with it since I have purchased it. Great vehicle with a couple glitches. Overall, I love my Honda CR-V! However, those consider purchasing one in the 2010 year model deserve to know that air conditioner problems are common. Mine went out last summer when I was 8 months pregnant and we had to pay $700+ to have it fixed at the local Honda dealership. Also there is a weird feature on the anti theft system that if you turn the car off too quickly after putting it in park, you'll be like locked in and the car alarm will go off. I nearly had a panic attack when this happened to me!! Other than these two flaws, I couldn't imagine a better vehicle. I definitely plan to have another CR-V in the future.